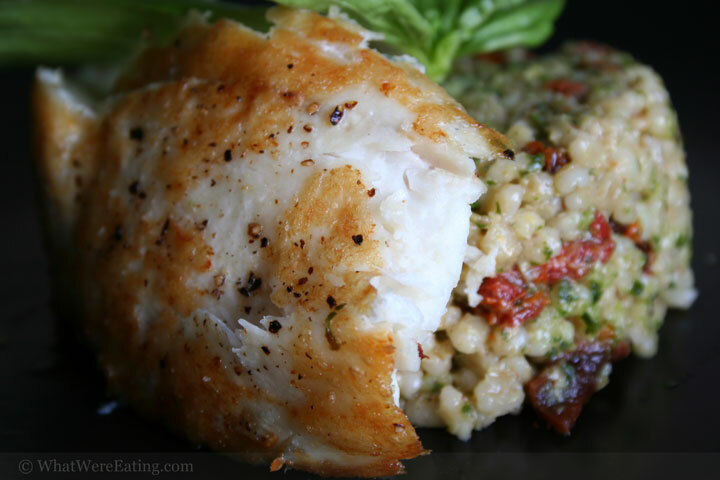 For dinner, we’re eating seared mystery fish on top of a barley salad. The salad is made with julienned sundried tomatoes, roughly chopped nicoise olives, basil ribbons and a pesto-lemon vinegarette. T: The barley salad was the shining star of this meal I thought. It rocked. A: it was pretty good. the concept of the meal as a whole was a lot better than my execution of it! i definately chose the wrong pan to cook the fish in. T: how was that pan the wrong one? A: hmm… maybe wrong is the wrong word. perhaps it was just an unfriendly/unforgiving pan. I used a heavy stainless steel pan for the fish and due to only having small burners work on our stove top, i don’t think the pan got hot enough, even over high heat, to caramelize the fish quick enough without over cooking it. when you are cooking meat, veggies too, but especially meat, the pan will release the food when it is ready to be flipped. if you try to flip it too soon, you will rip the outer layer and your food will look mangled. that kind of happened with this fish, i was trying not to over-cook it and ended up tearing it. if i had used a non-stick pan i could have avoided the situation altogether. A: yeah. i really don’t use teflon pans for much but they do have their place in the kitchen. T: so what did you think of the barley salad? A: i definately thought it was good. i think i was just a little frustrated by the time we ate that i didn’t whole-heartedly enjoy the meal. T: that’s a bummer. I whole-heartedly enjoyed it, if that makes you feel any better. A: 😀 well it certainly does, T! my spirits are quite high again. no need to fear. A: so did you enjoy our mystery fish, too? T: Yes I did. It was tasty, and went superbly with the barley salad. So, I know you were upset about the fish, but did you enjoy it? A: i did…. my piece of fish was very well-done, but i do think the combo went well together. Here’s a question for our readers – do you guys ever forget to label things in the freezer then totally forget what the hell is in those little bags? T: So what types of fish could that fish have been? What fishes have you bought lately? A: heheh, that’s really the problem. i just can’t remember. i know i bought the fish from henry’s, and i know it was only a couple weeks ago. I just can’t remember for the life of me what kind of fish I got! A: 😛 i’m gonna go with white fish. not whiting though. just some kind of white fish… i want to guess halibut but it just wasn’t that thick – aren’t halibut filets normally thick? T: So, rating time. I’m gonna give the meal a 4.4/5. 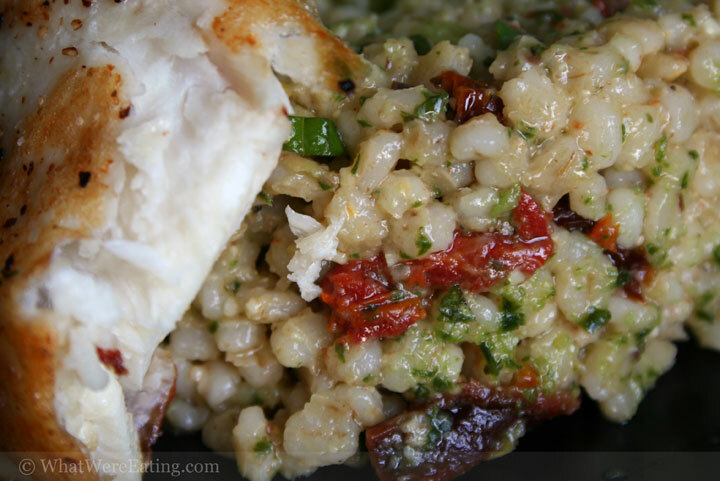 The fish had some mild texture issues but was tasty, the barley salad was killer. So that’s what it gets. T: yeah. “:-P” is right. The last thing you made was some of the best burgers of all time. Sucking roll. Ha. A: hmmm… sucking roll… that sounds like sushi to me. You are making me too hungry this morning! That meal looks fantastic and healthy! I’m so impressed that you managed to make a barley salad look so good in your photos. Oh, yes, I would be delighted to come along for lunch or dinner any day! Sucking roll indeed. I think one of the best things is to find simple foods that really rock the boat looking so good. This looks soooo good. I really enjoy barley. This one looks sensational. It’s great to know that this meal is also healthy and I bet delicious! Great looking meal! I can taste it from here. looks like tilapia to me! yum yum ! This looks so good ! I completely agree tanna! Simple is great just let the flavors shine. thanks charles! it was pretty good, although by the time i was eating it i was frustrated from all the mishaps that occurred while i was cooking. t thought it was great though! Lea, i agree it does look like tilapia, i just didn’t think i had bought any tilapia lately! man, i gotta start labeling the stuff in my freezeer. i have some mystery fish defrosting right now, and lots of barley! can i have the recipe please? it looks yummy! janice, i’m so sorry to have not gotten back to you in time for you to make the barley salad. I’m going to post the recipe soon. Went i went to look for a previous pesto recipe to shorten my writing time, i found out i had lost all those recipes to the damn mozzilla bug. I’ll get it up soon though! I promise. I decided to try out a version of your salad. I hadn’t had pearl barley before but it looked good here so I bought some. Thanks for the inspiration. It was really good, although I over-lemoned mine a little. I’ve put a picture on my blog now. You probably wouldn’t believe what I served it with! Where can I find the recipe for your barley salad? It looked so good I wanted to lick my monitor.